Cooma Car Club, Bolaro Street, Cooma. Photo: Cooma Car Club. One of the Monaro’s busiest and most interesting community organisations is celebrating the completion of a milestone. Cooma Car Club has opened the Don Bottom Memorial Shed, a stand-alone colour bond shed at the northern end of their existing Museum. Members hope the Memorial Shed is a fitting way of remembering Don Bottom, a long-standing Car Club member and benefactor. The shed will be utilized for storage, as a toolshed and workshop and importantly will enable the full development of the museum. 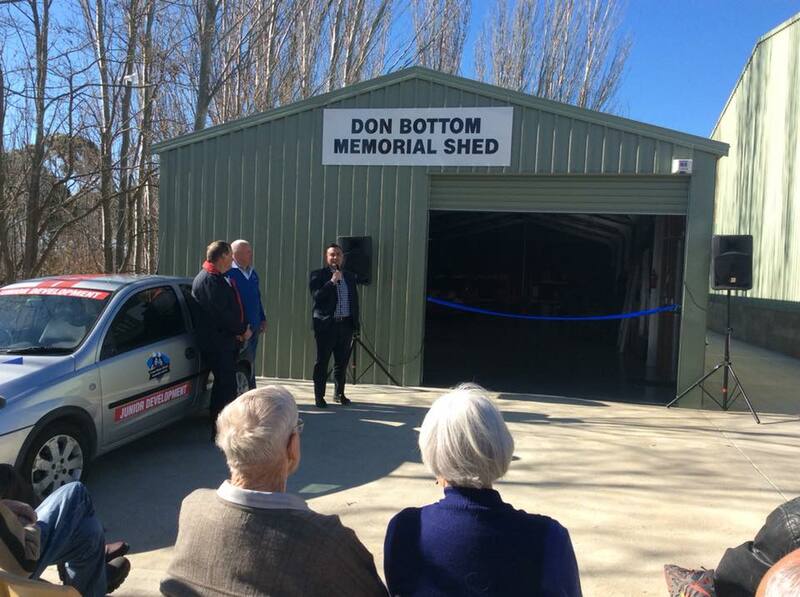 Member for Monaro, John Barilaro opening the Don Bottom Memorial Shed. Photo: Cooma Car Club. Photo: Car Club Facebook. Member for Monaro, John Barilaro cut the ribbon recognising the NSW Government’s $50,000 contribution. “The history of motoring in Cooma and across the region is fascinating and deserves to be preserved, that’s why I’m pleased to support this worthwhile project which will help the Cooma Monaro Historic Automobile Club to do so,” Mr Barilaro says. The Deputy Premier was interested to learn that in 1917 there were just 28 cars in Cooma. “The very first motor vehicle was an Alldays & Onions, and Cooma’s first car clubs were established in the 1950s and 1960s,” Mr Barilaro says. The project started in February 2017, the efforts of local contractors and Car Club volunteers a big part of the success. The next big event on the Car Club’s calendar is the popular Girder Fork Rally which will take in the scenic sealed roads of the Snowy Monaro. The rally is exclusive to Girder Fork Bikes manufactured prior to 1950 and usually attracts around 50 entries. The Girder Fork Motorcycle Rally will run October 19 to 21. Cooma Car Club meets 7:00 pm on the first Monday of each month at their clubhouse on Bolaro St.